Espionage, wiretappings and attempted coup d'etats...just what is going on in Macedonia? 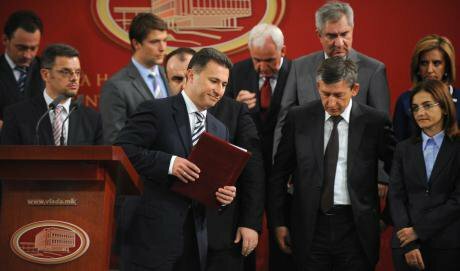 There has been plenty of material for such discussions in the last two weeks, since the country’s Primer Minister, Nikola Gruevski, dramatically informed the public that an alleged coup d’état, orchestered by the opposition leader, Zoran Zaev, was prevented. In an effort to control the narrative of what was to follow, in his address that was aired live by all major TV stations, the PM alleged that Zaev tried to blackmail him into forming a caretaker government with documents proving the current government’s wrongdoings and corruption obtained from foreign intelligence services. This comes after months of Zaev saying that he is to publish materials, what colloquially came to be known as ‘the Bomb’, that prove such criminal activities that the PM will be forced to resign. On the day of the address, Zaev was charged with ‘espionage and violence against top state officials’, together with three other people, and he was ordered to surrender his passport. In the meantime, a current and a former employee of the Ministry of Interior were charged with co-conspiring. On January 9, at a press conference Zaev accused Gruevski and the head of the security and counterintelligence service, his cousin Saso Mijalkov, for wire-tapping over 20,000 citizens, in a country of less than two million, in the course of five years. Part of the recordings, allegedly provided by whistleblowers in the Macedonian intelligence services, was presented. The opposition leader has promised for all the non-personal material, organised by topics, including electoral fraud, media censorship, financial crime, to be published in the upcoming weeks. The wiretapping was of such wide scale that even the closest allies to the PM, including his godfather, the Minister of Finance, along with the Minister of Interior have been listened to. A conversation between the two of them, inter alia discussing state employment, was among the first published materials. The whole scandal has set the Macedonian public in a frenzy, with the imagination and conspiracy theories running wild. Many things about the whole operation remain unclear. The questions discussed are overall centred around two issues: the origin of the recordings and the content. In general, there are two narratives emerging in regards to the origin of the materials. One is that of the wire-tapping being organised by foreign intelligence services, in which scenario Gruevski is portrayed as a patriot defending the state and Zaev as a traitor for working with foreign services on undermining the state sovereignty and stability. The other narrative is based on the assumption that it was the Macedonian intelligence services who conducted the eavesdropping, and in that narrative Gruevski is the traitor for illegally spying on the citizens and Zaev emerges as the patriot claiming to be publishing the materials with democracy and freedom in Macedonia as the ultimate goals. Both hypotheses ought to be unpacked in order to understand what is at stake. The first hypothesis is based on the PM’s statement at the press conference, claiming that Zaev himself confirmed during their meetings to have been obtained the materials through foreign services. He is heard claiming the same on a leaked video secretly taped during their meeting in the PM’s cabinet. Importantly, this hypothesis assumes that either one of the countries having access to satelite equipment needed for such an operation has an interest in spying on more than 1% of the population of the country, or that another country is aided by elements inside the Macedonian intelligence service in the operation. Regardless of the implausibility of first one of these assumptions, the truthfulness of any of these two would mean a grave breach of the country’s intelligence services for a long period of time, for which the governing structures ought to be held accountable. Moreover, it is curious that no diplomatic note or letter of protest has been issued by the government in relation to the scandal. The second hypothesis is based on Zaev’s statement that the materials were received through ‘patriotic’ whisleblowers within the country’s intelligence system which did the eavesdropping through the mobile phone networks. The wire-tapping can legally last only four months, with the possibility of that being extended for another four. It also requires a court order issued at the request of the public prosecutor and is only possible in cases when there is a reason to believe that a crime is to be or has been committed. Without such court orders, this hypothesis would mean that those ordering the wire-tapping were acting illegally and unconstitutionally. This, too, would require for the governing structures to be held accountable. In order to fully grasp the impact, one has to contextualise this in a totally polarised and depoliticised society, where two parallel societies seem to be existing side by side and with any form of political deliberation being completely removed from the public sphere. Moreover, this is a country where the freedom of media in 2014 has been ranked the lowest in the region, with Reporters Without Borders noting that Macedonia has never ranked this low. It is also a country where the last census was held in 2002 and the unemployment rate according to the International Monetary Fund in 2012 was projected at more than 31%. It is a society of fear with no trust in the impartiality of the judical system and with an extended control of the government in all spheres of people’s lives. Finally, the scandal comes at a time of public discontent resulting in frequent protests and strikes of students and professors, contract workers, teachers, and journalists. To that end, with the tremendously limited media space available, keeping in mind that very few of the mainstream media, almost all of which have close ties to the governing elite, have even reported on the materials, the impact so far is rather contained. However, what the materials published to-date have managed to achieve is a certain demystification of the core of the ruling elite and the PM’s closest allies. Previously believed to be a well-oiled machine, the published conversation between the two ministers and the fact that even the leaders of the government propaganda machine have been wire-tapped points to incoherence, disrespect, and paranoia within that core. The second and more important aspect of the content of the materials is that, if what has been said of them thus far is true, they point to a small group of people getting incredibly rich through shady activities. While the wire-tapping itself, especially given the country’s communist legacy, might not come as a surprise to most ordinary people, revealing that those in the country’s leadership whose public image has been carefully crafted as hard-working and honest people have in actuality been involved in grave financial crimes might hit a nerve at a time of general economic hardship.